Laminitis in horses is a devastating condition once it takes hold. With a holistic horse care program you can significantly lower the risk of laminitis in horses but you still must stay alert for early signs of the condition. There is no vaccine against laminitis in horses, so diet and management are your best defenses. To avoid laminitis in horses you want a low starch diet. Starch is broken down into sugar and sugar triggers insulin levels to rise in the blood. Insulin is essential for proper starch(carbohydrate) metabolism but it also has very negative effects on the body. If a high starch diet is fed long term then a condition called insulin resistance can develop. With insulin resistance, the cells are no longer able to process glucose for energy. This will cause the cells to be damaged and in the case of the cells in the hoof laminitis is the result. Native grass pasture is the ideal horse feed but lush grass conditions can lead to overeating and laminitis. Most grass hay is low in starch so it should be the foundation of your horse feeding program. Some growing and harvesting conditions, such as sunny weather following rain, can cause grass hay to be high in starch. Drought or frost stress can also increase starch levels in grass hay. If you are not sure about how your hay was grown or harvested it is ideal to have it tested before you purchase a large quantity. Grains, such as corn, barley and oats are high in starch. Lower starch substitutes for grain include – beet pulp, chopped hay, or soybean hulls. Most horses in light work need very little to no grain. There are some good low starch horse feeds available but because they are processed they are not always easy for the horse to digest. Adding quality probiotics and digestive enzymes to processed low starch horse feeds will make them much easier for the horse to digest. Fat supplements, such as rice bran, can be fed to meet calorie needs for horses that are in harder work. Grass hay and formulated low starch horse feeds alone may not be enough for your horse to thrive. Processing will lower the natural chlorophyl and vitamin content of horse feeds. Whole foods that contain these important nutrients need to be added to back into the horse’s diet. Examples of high chlorophyl and vitamin rich whole foods include – blue green algae, fresh alfalfa hay, and carrots. If your horse is doing much work he will need some extra antioxidants in his diet. Blue green algae is high in the natural antioxidant, beta carotene. Beta carotene is also the precursor for Vit A which the horse needs for healthy skin and hooves. Other sources of antioxidants include mangosteen juice, noni juice as well as CoQ10, wheat sprouts and natural sources of Vit E and C. I like Citrus C/Q as a great source of Vit c and bioflavanoids. Omega 3 fatty acids are also a very important part of the diet that is missing from processed hay and horse feeds. My favorite way to get omega 3 fatty acids to the horse is chia seeds. Chia seeds are also rich in minerals needed for healthy hooves. Exercise is the hallmark of a good laminitis prevention program. Did you know that 1 hour of exercise a day will drop insulin levels to normal for 24 hours? In a natural state horses would move all day long as they foraged for food but when they have to be confined to a paddock and fed hay they don’t move near enough. 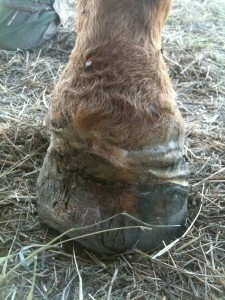 Regular hoof care is important so flares do not develop. Flares on the hoof wall will cause mechanical separation between the sole and wall which will stress the hoof lamina. If you feel you have to shoe your horse be sure and use a wide web shoe and ideally use fill in pad material for frog support. Never let your horse’s toes get long or allow the hoof wall to grow past the support of the shoe. Chronic stress from confinement or frequent trailering and competition, especially when combined with a high starch diet, can trigger a horse into insulin resistance. Frequent glucose spikes in the bloodstream from a stress reaction will cause insulin levels to rise. Some horses are predisposed to insulin resistance but with enough stress, any horse can develop this condition. Signs of insulin resistance include – excess weight despite a lower calorie diet, a lethargic attitude, a cresty neck and hard fat deposits over the shoulders and at the base of the tail. A decrease in stress combined with a low starch, mineral balanced diet may reverse insulin resistance before it leads to laminitis.